As thousands of Syrians fleeing to Armenia, Ila, her husband and her three children (as the fourth one was studying in Aleppo, and later on found safety in Lebanon), had to go through the harsh conditions of the refugee camps in Turkey. Misery and depravation forced Ila`s husband and her 12-year-old son Aram to go back to Syria with the hope to sell their undamaged property. Ila`s husband never came back, he was killed by ISIS in front of Aram. Unemployed, with unsecure shelter, diagnosed with cancer, and three children to care of, Ila is in a gloomy limbo situation. 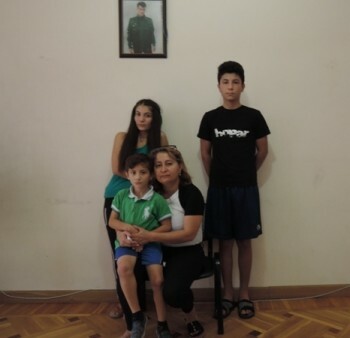 Each month starts with a horrifying feeling of being evicted from her two-bedroom apartment in the outskirts of Yerevan, provided on monthly basis by a private donor. The current conditions are as such that Ila and her children, besides the daily needs for their survival and psycho-social support, need permanent durable housing and employment solutions. Let`s join efforts and make Ila`s story an exception with a happy end. Currently, many vulnerable refugee families in Armenia need your urgent support.